The first space environment cleaners! ASTROSCALE is the remover of space debris. Company name: ASTROSCALE PTE. LTD.
Service usage: Purchase request, Control contract and NDA, Request form for business trip, Request form for a leave, etc. ASTROSCALE PTE. LTD. (ASTROSCALE) was established in Singapore in 2013. 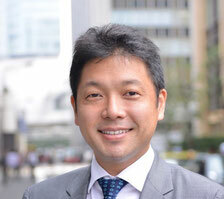 CEO of ASTROSCALE, Mitsunobu Okada, has had brilliant careers working at the Ministry of Finance and McKinsey & Company, Inc. He now travels around the world to solve the space debris problem. Today, we had a talk with Ms. Ai Makino, Corporate Office of ASTROSCALE to find out what ASTROSCALE's projects are. ASTROSCALE works on the space debris problem. 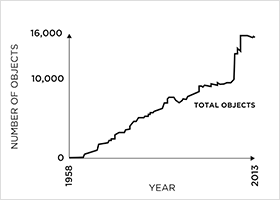 Space debris also called space junk is considered a growing problem. ASTROSCALE is working to come up with ideas for how to remove space debris. Let's see, what is space junk? Space junk (space debris) is the collection of defunct manmade objects in space such as old satellites, spent rocket stages and other objects that used to be part of space activities. 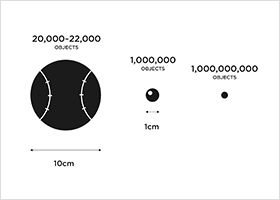 Amount of space debris in space is estimated to be over a million (20,000 objects larger than 10cm, 1,000,000 objects larger than 1cm and 1 million objects smaller than 1cm) orbiting above us. What is the problem with the space debris? It may seem to be very unreal when you hear how dangerous space debris could be as space is so huge. But the space debris problem has drawn people's attention recently. Even astronauts have concerns about the space debris problem. In the 2013 movie ‘Gravity’, the movie starts with the space shuttle colliding with space debris. Ms. Makino says, for real life astronauts the fear caused by the possibility that their space shuttle could collide with space debris while they are up in space is greater than that caused during the shuttles launching or landing. The space debris orbits around the Earth at 7-8km/sec. This is equivalent to 10 times faster than the speed of a bullet. Due to their enormous orbital speed, even tiny debris colliding with bigger debris could create more debris. Do not forget there are 1 ton size satellites and upper part of space shuttles in space. ASTROSCALE is aiming to remove space debris that could cause serious problems in space by proposing the project ADRAS (Active Debris Removal by Astroscale). 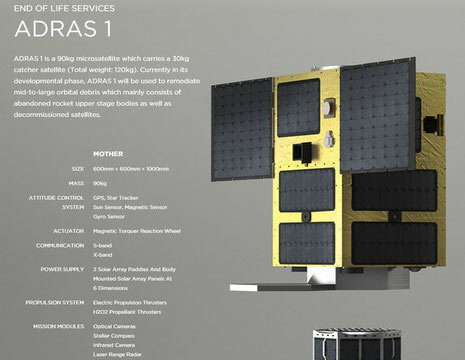 ADRAS is a small satellite, and ASTROSCALE is planning to do a demonstration experiment by using ADRAS in 2018. 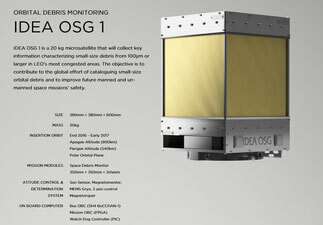 The plan is to launch the space debris catching satellite (size: 60cm3, weight: 100kg) into the space, and use its unique adhesive technique to catch space debris. Then, by using a propellant to reduce start-up speed of space debris, lead it to the earth’s atmosphere. It will be burnt by entering into the atmosphere. It is very difficult to get close to space debris as it is freely floating in space. This project costs a lot of money and takes time. It is very expensive to carry out verification experiments to prove which parts and satellites can stand the extreme temperatures (-50 degrees to 200 degrees) in space. We cannot claim which country is to blame for the space debris problem. There is a problem with who is going to pay the huge cost to clean up space debris. Another problem is how United Nations and space agencies of each country work together. At the moment it’s not very organized. We have not established the techniques of how to remove space debris. ASTROSCALE puts effort into solving these complicated problems. We also asked ASTROSCALE about the revenue of such a specialized space industry. One of the business models we are focusing on is to work with constellation players.’ Ms. Makino says. There are about 20 million people around the world who do not have access to the internet. The constellation players are companies who believe providing the internet to those people will change the society. They are trying to launch small satellites into space to create an internet network. Some companies such as SpaceX, Facebook and Samsung are working to create the internet network by setting the satellites in space (30 satellites per an orbit). Unfortunately, 5-7% of satellites (hardware) will not last long. The business model here is to provide these companies with a collection service for their broken satellites. ‘Another revenue model is to work with aerospace manufacturers.’ Ms. Makino says. The great news is that some of the major Japanese companies such as Otsuka Pharmaceutical and OSG Corporation (one of the leading Japanese comprehensive cutting tool manufacturers) realize how severe the space debris problem could be, and they have started sponsoring ASTROSCALE’s marketing activities. ‘I strongly believe that it will be a motive to move the government and even the United Nations by making more people aware of the space debris problem. If each of us is more aware of the problem, companies will spontaneously react to the problem. And of course, there will be a greater awareness in society.’ Ms. Makino says. We could feel her passion and faith toward solving the space debris problem. Apparently in Japan, people's awareness of the space debris problem has changed within a year as the government established the space policy committee. It may not be too far from now when companies like ASTROSCALE who try to solve the space debris problem can work on their projects smoothly. ASTROSCALE has about 20 employees and develops their techniques at Astroscale Japan Inc. 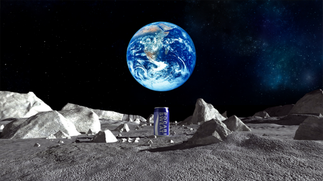 It may sound like a very small company when you hear ASTROSCALE has only 20 employees. But ASTROSCALE does joint research with universities, and works with companies that have brilliant production techniques in order to develop their small satellites. ASTROSCALE has over 50 associated companies. ‘We develop our technologies in Japan, but the space debris problem is a worldwide problem. We cooperate with aerospace manufacturers and companies in the U.S that have a strong background in the aerospace industry to expand our business worldwide.’ says Ms. Makino. ASTROSCALE mostly uses parts made in Japan as there are import regulation problems. It could cause problems if we use parts made overseas. Ms. Makino says ‘ASTROSCALE has an advantage in using parts made in Japan. In the future, we would like to sell parts that we develop with the universities.’ She tells us how using parts made in Japan and developing technology in Japan could be an advantage to ASTROSCALE. 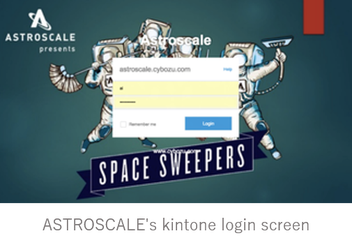 Such company like ASTROSCALE favorably uses Cybozu, Inc.'s kintone. Let’s have a look at how they use it. ‘In order to develop our business, we need to import and save information such as schedules and costs from engineers regularly, and we talk to our accounting department about accounting data every day. We need a huge amount of parts to build a satellite, and people in each project need to buy their parts. It was getting very difficult to control who needs what. That is why we needed to systemize our purchase requests. We compared systems from three different domestic and international companies. We decided to use Cybozu, Inc.'s kintone system, it is because of their high accessibility such as flexibility of customization, mobile environment and allows us to use both Japanese and English.’ Ms. Makino says. Thanks to our systemized purchase requests on the kintone system, it is clear to see company’s money flow and activities, and we cannot buy any parts without a supervisor’s approvable. Also, it is because the process of purchase requests is well established, we can handle an audit much easier than before. ‘Process control is very clear to see. It is very useful for accounting as we can output stored data into CSV data files. 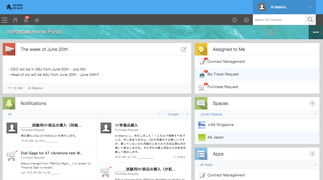 We can create a clear workflow.’ As ASTROSCALE has companies in Japan and Singapore, it is also very useful that the kintone system can be used in Japanese and English. Now they use the system to make purchase requests, control contracts and NDA, make requests for business trips and leave requests. But also, they would like to use the system for inventory control near future. ‘It is very important that we make the demonstration experiment of ADRAS project successful in 2018 and prove that this business can make revenue in the future. As our motto, our mission is to actively contribute to the sustainable use of the space environment; we will try to solve the space debris problem and work to make an impact on society.’ Mr. Okada says. The space debris problem has no international regulations or serious activity results as there is no border. We cannot take our eyes off ASTROSCALE takes up the challenge of this unprecedented business from the center of Asia, Singapore.